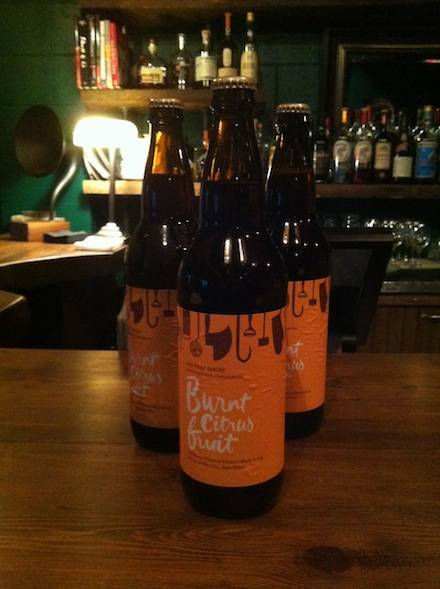 Foodies and craft beer lovers united this past Friday for the official launch of R&B Brewing‘s Burnt Citrus Fruit ESB. It was a miserable, torrential afternoon outdoors, but livers and spirits were warm and cozy indoors at Campagnolo’s upstairs bar/restaurant. Campagnolo head chef Robert Belcham is the third and most recent participator in R&B’s Chef Series of beers. Designed to showcase the talent and culinary creativity that makes their chefs standouts of the city’s food scene, the series is an on-going collaboration between the longstanding microbrewery and various notable Vancouver restaurants. For the latest brew, Belcham chose to combine the sweet acidity of burnt oranges, lemons and grapefruits with the complex subtle smokiness of none other than 30 pounds of charcoaled pork bones, which were used in the filtration process. Charcoal is traditionally used as a method of adding a smoky component to beer, but the swine idea was courtesy of Belcham. R&B’s head brewer Todd Graham knew going into the process that there would probably be some sort of meat component involved, but admitted to being surprised by the choice nonetheless. 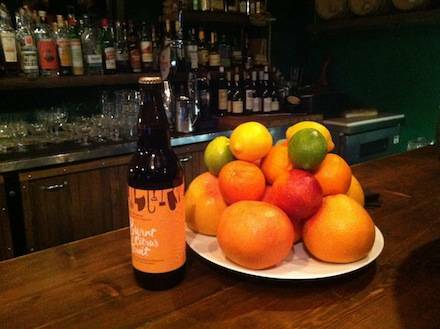 The limited release beers are created with particular food pairings in mind. In this case, guests and media were treated to an array of meaty snacks. Crispy Chicken Skins with Ricotta, Chives and Thyme, and Pork Truffle Sausage with Burnt Citrus on Crostini continued the meaty theme, although the saltiness of an arrangement of charcuterie is a recommended acceptable pairing for the less adept cook. This entry was posted in dining and drinking, Features and tagged Campagnolo, craft beer events, R and B Brewing, Vancouver craft beer. Bookmark the permalink.